From left: : Krystal Darby, Donna Leon, Edwina Eppley, Marcia Tenebrusco, Linda Goudielock, Nina Jolly, June Schirone, lona Chacon, Tina Wade, Chris Diaz, Jaquetta Alexander, Cheryl Kantor, Chris Conforti, Eve Long, Sharon Kelly, Pam Shelby, Jessie Dwivedi, Janice Byrd, Jose Medina, Daniel Davis, Erin Wilson, Flor Robles, Diane Swearinger, Stephanie Green-Hunley, Connie Lyons, Torri Hitchings, Laura Lichtenwalner, Irma Burrell, Sabina Prijic, Genevieve Rodriguez, Katie Ezzo, Ergis Zorba, Lisa Sartori, Frank Chacon, Laura Obery, Patty Vance, Jeanne Dugan, Nina Miller and Valerie Jovanovich. This week, we feature members of the tight-knit team at Howell Elementary School. Howell has about 360 students and a staff that cares about each one of them--and each other. Below, read what the people in this group have to say about the work they do at the school and the support they feel from the Howell community. 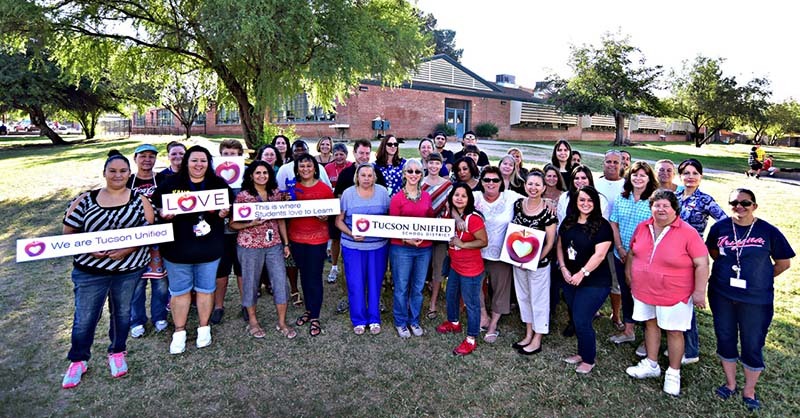 If you know a team we should feature, please send us an email at media@tusd1.org. Krystal Darby, monitor: I love Peter Howell cause the have a wonderful staff. Lisa Sartori, fourth-grade teacher: We are a big family and very supportive of each other. Valerie Jovanovich, community education coordinator: Community -- everybody working together. Mrs. Nina Miller, math interventionist: I love my Howell Team because we feel like a family. We laugh and cry together; we celebrate, collaborate and struggle together. We are all passionate about what we do. Howell feels like my second home. Sabina Prijic: The kids I work with are so enthusiastic to learn, and the teachers are super welcoming. Flor Robles, ELD K-5 teacher: Working with my ELL students is what I love to do best! Katie Ezzo, third-grade student-teacher: I love that this is a kindness school! Irma Burrell, third-grade teacher: I love our unity! Our school feels like a great big family, where everyone cares about one another. Patricia Vance, safety monitor: I love the staff. This feels like home. Tina Wade, counselor: I love the sense of belonging and comradery here! Lona Chacon, exceptional education teacher: We are united, we work together. It is a really great family environment, loving and caring. Ergis Zorba, exceptional education teacher: I love working at a school that's unified and such a good team. Franck Chacon Jr., exceptional education teaching assistant: Peter Howell is a great family environment. Stephanie Hunley, teacher: We are family, all my fellow teachers and me. Janice Byrd, teacher: I love that we are family! We work play and grow together. I don't want to be anywhere else. Sharon Kelly, teacher: I love all of my colleagues! I love all of our Peter Howell Hawks! Hawks Rock! Eve Long: I love the camaraderie between teachers and students. Everyone loves to help! Erin Wilson: I love working with the kids and the staff. Pam Selby: It's all about the people! Everyone helps each other to do their best! Chris Diaz, kindergarten teacher: Staff is fantastic and very supportive. Kinders Rule! They love Pete the Cat! Marcia Tenebruso, exceptional education teaching assistant: I love that this is not just a job, it's a family! Nina Jolly, kindergarten teacher: Peter Howell has great kids, great families and wonderful co-workers! It's a nice place to be! Chris Conforti, school psychologist: I love that Howell Elementary is a family, supportive environment where I always feel at home. Jaquetta Alexander, principal: I love working with the kids and amazing staff at Peter Howell. Genevieve Rodriguez, office manager: Howell staff is a family. We are a community who takes care of one another professionally and personally. We as a community take care of our students & build relationships with them we are a community who cares. Mrs. Dwivedi, fifth-grade teacher: Our fifth-graders are kind, funny, sweet and enjoy learning! Our fifth-grade team works like a cohesive unit, even finishing each other's sentences! Our staff and principal support each other to grow professionally and have a great time doing it! Cheryl A. Kantor, exceptional education teaching assistant: I love that our school is like a big community and we all watch out for each other. I love my job because I get to work with the most unique students. Our team is great. Tina Schivone, community family liaison: Our supportive principal and the amazing sense of community we feel every day from staff, family and our dedicated volunteers. It's a great place to work! Laura Obery, teacher: I love the sense of community at our school! Everyone helps take care of, and look out for everyone-students, staff and families. It makes for a wonderful environment! Jeanne Dugan, exceptional education teaching assistant: Everything. Daniel Davis, exceptional education teaching assistant: I love Peter Howell. Teaching creating and inspiring.